Director – Arthur Allan Seidelman, Screenplay – Michael Sloan, Producer – Michael Sloan & Frank Yablans, Photography – Dannielle Nannuzzi, Music – Richard Band, Makeup Effects – Mechanical and Makeup Imageries Inc (Supervisor – John Buechler), Production Design – Giovanni Natalucci. Production Company – Altar Productions/Empire. A woman at home alone in her forest cabin is interrupted by a stranger who says his car has broken down and needs to use her telephone. She finds some elements of his story suspicious. He then reveals that she sabotaged his car so that she could lure him here to murder him. A psychological battle between the two grows in which he reveals that he is a police officer come to investigate her probable murder of her husband and daughter. However, she pulls holes in these claims too where neither appear to be telling the truth about what is happening. The Caller is surely the strangest genre item that Charles and Albert Band’s Empire Films ever released. Empire were a prolific company producing B genre movies such as the Ghoulies and Trancers films. The Caller is ostensibly a psycho-thriller. 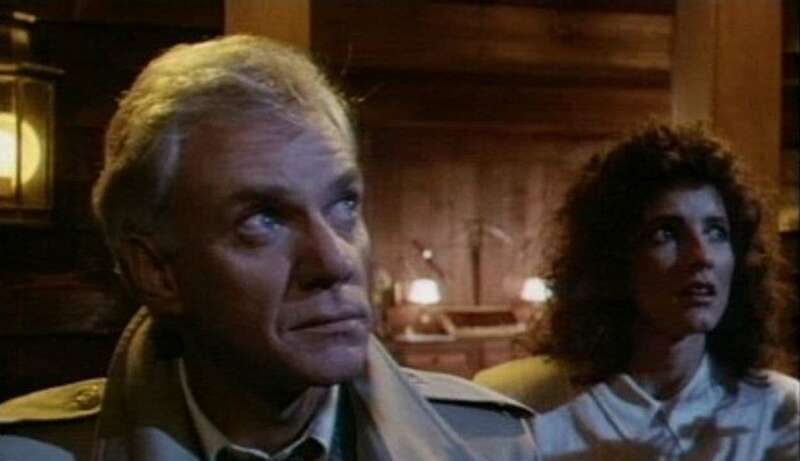 Malcolm McDowell visits Madolyn Smith where she lives in a remote cabin in the woods. They circle around one another playing peculiar psychological games. Nothing is ever what it seems. Both seem to know things they aren’t meant to – he seems to know they are on Cutter’s Ridge despite her revelation that the sign blew over; he peculiarly seems to know the tow-truck number off by memory; she seems to know that his tire was blown by a broken bottle and that it was his front tire. The plot continually pulls everything out from the audience – she suddenly reveals that she may have deliberately set his accident up so as to lure him here to murder him; he reveals that he may be an undercover cop and hinting that he knows that she may have killed her husband and daughter. Each time enough doubt is left to suggest that such may not necessarily be the case. By the end, the two are openly acknowledging it as a game between them and counting points against the other as they expose holes in the other’s story. The games get so weird that the film becomes truly fascinating. The end twist, which unexpectedly takes The Caller from the realm of a psychological thriller into science-fiction, comes as a completely left field. It is one that only makes a limited degree of sense, nevertheless has a outre wildness and ingenuity to it. Arthur Allan Seidelman was a director who mostly worked in television. He produced a minor number of other genre entries including Arnold Schwarzenegger’s first ever film, the spoof Hercules in New York (1970); the horror film The People Across the Lake (tv movie, 1998), the Arthur C. Clarke adaptation Trapped in Space (tv movie, 1994) and a musical version of A Christmas Carol (tv movie, 2004).